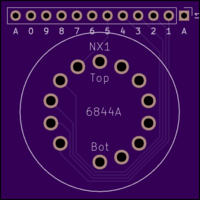 Here are some links to various breadboard adapters I have made. 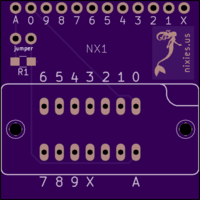 The later adapters have pads for NeoPixels to be soldered to them. These are completely optional. They also have the option of soldering an anode resistor directly to the adapter. Almost all of them use these pins to create a socket. These pins come in two sizes – most are 1mm, some are 0.6mm. The listing at OSHPark will indicate which one it is. Most of the footprints were made by me – experience has shown that footprints available on the web often have poor pin placements, incorrect outlines and bad orientation. 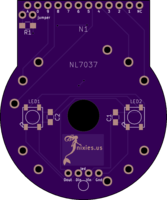 I will provide a link to Eagle and Kicad footprints just as soon as I have uploaded them. 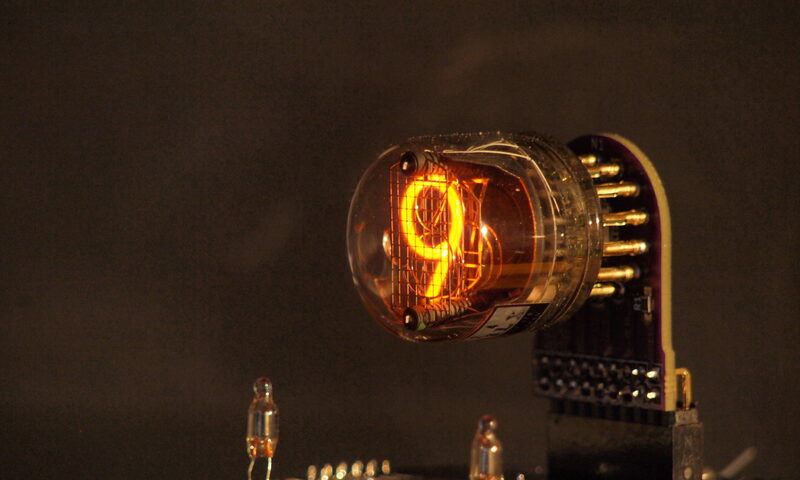 I recommend looking at Dieter’s socket page for information about the original sockets used by Nixie tubes. 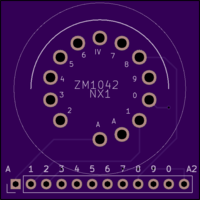 The description says ZM1042, but it will work with many similar tubes. These tubes use a B13B socket layout – but the pin-outs aren’t the same for all tubes that use this socket type. This socket fits many tubes, including the 6844A. These tubes use a B13B socket layout – but the pin-outs aren’t the same for all tubes that use this socket type. This shows the true outline of the tube and the holes are all correctly placed. The footprint most commonly available is incorrect. 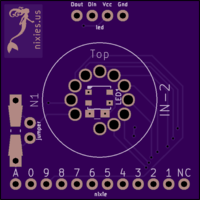 This tube uses the SK-136 socket layout and is actually pin compatible with the B5991 shown next – it is just a different size – so you could use either. A B5991 adapter. 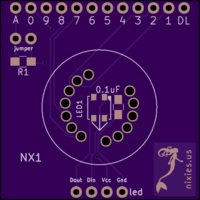 This was my first board that included support for NeoPixels and an on-board current limiter. 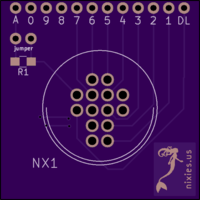 I also start designing adapters for top-view Nixies for vertical placement, so that the tube would be viewed from the front rather than from the top. Again, several other tubes would work with this adapter. 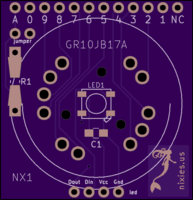 This tube uses a SK-136/SK-144 socket layout, also sometimes referred to as ‘oval nixie’. A ZM1000 adapter. These tubes use the smaller 0.6mm diameter pins. This tube uses a 55702 ‘Eurogrid’ socket layout. This adapter is intended for use by any tube with flying leads. A B5441 adapter. This will work with many tubes in this family, e.g. the B5441A. These tubes use the smaller 0.6mm diameter pins. This tube uses a SK-182 socket layout. A NL840/NL807 adapter. This will work with many tubes in this family. This tube uses a RTS-14 socket layout. A CD-12 adapter. This tube uses a TSB-14P socket layout. An adapter for the enormous NL7037. It can also be used for the Z568 (or, I assume the R|Z568), but they plug in rotated 180 degrees – so they face the other way! 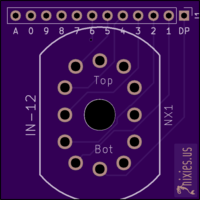 This uses the RTS-5 socket layout. An adapter for the GR10J. This uses the B17A socket layout. An adapter for the IN-2 or the IN-8. 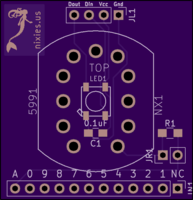 This uses the RSH27 socket layout. 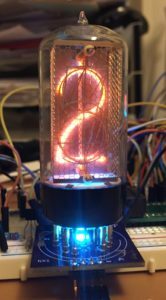 do you have any SK-136 Nixie Tube Adapters for sale? These boards look great! 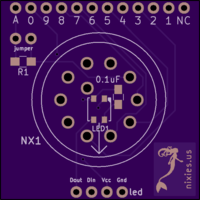 Just so I’m 100% clear before I go ordering stuff, the B5991 with the neopixel support will *also* work with an IN-12A/IN-12B russian nixie right? I have 8-10 of those I got a few years ago and the wife wants me to make something pretty with them (lol). Thanks for putting all your hard work up for others to use. Yes it will. 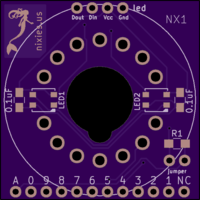 I also have a more compact version on OSHPark: https://oshpark.com/shared_projects/wZy9TRTH.